For other uses of "Cacao", see Cacao (disambiguation). The cocoa bean or simply cocoa (/ˈkoʊ.koʊ/), which is also called the cacao bean or cacao (/kəˈkaʊ/), is the dried and fully fermented seed of Theobroma cacao, from which cocoa solids (a mixture of nonfat substances) and cocoa butter (the fat) can be extracted. Cocoa beans are the basis of chocolate, and Mesoamerican foods including tejate, a pre-Hispanic drink that also includes maize. The word "cocoa" comes from the Spanish word cacao, which is derived from the Nahuatl word cacahuatl. The Nahuatl word, in turn, ultimately derives from the reconstructed Proto Mije-Sokean word kakawa. a mixture of cocoa powder and cocoa butter – a primitive form of chocolate. The cacao tree is native to the Amazon Basin. It was domesticated by the Olmecs and Mocayas (Mexico and Central America). More than 4,000 years ago, it was consumed by pre-Columbian cultures along the Yucatán, including the Mayans, and as far back as Olmeca civilization in spiritual ceremonies. It also grows in the foothills of the Andes in the Amazon and Orinoco basins of South America, in Colombia and Venezuela. Wild cacao still grows there. Its range may have been larger in the past; evidence of its wild range may be obscured by cultivation of the tree in these areas since long before the Spanish arrived. As of November 2018, evidence suggests that cacao was first domesticated in equatorial South America, before being domesticated in Central America roughly 1,500 years later. Artifacts found at Santa-Ana-La Florida, in Ecuador, indicate that the Mayo-Chinchipe people were cultivating cacao as long as 5,300 years ago. Chemical analysis of residue extracted from pottery excavated at an archaeological site at Puerto Escondido, in Honduras, indicates that cocoa products were first consumed there sometime between 1500 and 1400 BC. Evidence also indicates that, long before the flavor of the cacao seed (or bean) became popular, the sweet pulp of the chocolate fruit, used in making a fermented (5% alcohol) beverage, first drew attention to the plant in the Americas. The cocoa bean was a common currency throughout Mesoamerica before the Spanish conquest. Cacao trees grow in a limited geographical zone, of about 20° to the north and south of the Equator. Nearly 70% of the world crop today is grown in West Africa. The cacao plant was first given its botanical name by Swedish natural scientist Carl Linnaeus in his original classification of the plant kingdom, where he called it Theobroma ("food of the gods") cacao. Cocoa was an important commodity in pre-Columbian Mesoamerica. A Spanish soldier who was part of the conquest of Mexico by Hernán Cortés tells that when Moctezuma II, emperor of the Aztecs, dined, he took no other beverage than chocolate, served in a golden goblet. Flavored with vanilla or other spices, his chocolate was whipped into a froth that dissolved in the mouth. No fewer than 60 portions each day reportedly may have been consumed by Moctezuma II, and 2,000 more by the nobles of his court. Chocolate was introduced to Europe by the Spaniards, and became a popular beverage by the mid-17th century. Spaniards also introduced the cacao tree into the West Indies and the Philippines. It was also introduced into the rest of Asia and into West Africa by Europeans. In the Gold Coast, modern Ghana, cacao was introduced by a Ghanaian, Tetteh Quarshie. The three main varieties of cocoa plant are Forastero, Criollo, and Trinitario. The first is the most widely used, comprising 80–90% of the world production of cocoa. Cocoa beans of the Criollo variety are rarer and considered a delicacy. Criollo plantations have lower yields than those of Forastero, and also tend to be less resistant to several diseases that attack the cocoa plant, hence very few countries still produce it. One of the largest producers of Criollo beans is Venezuela (Chuao and Porcelana). Trinitario (from Trinidad) is a hybrid between Criollo and Forastero varieties. It is considered to be of much higher quality than Forastero, has higher yields, and is more resistant to disease than Criollo. During harvest, the pods are opened, the seeds are kept, and the empty pods are discarded and the pulp made into juice. The seeds are placed where they can ferment. Due to heat buildup in the fermentation process, cacao beans lose most of the purplish hue and become mostly brown in color, with an adhered skin which includes the dried remains of the fruity pulp. This skin is released easily by winnowing after roasting. White seeds are found in some rare varieties, usually mixed with purples, and are considered of higher value. Immature cocoa pods have a variety of colours, but most often are green, red, or purple, and as they mature, their colour tends towards yellow or orange, particularly in the creases. Unlike most fruiting trees, the cacao pod grows directly from the trunk or large branch of a tree rather than from the end of a branch, similar to jackfruit. This makes harvesting by hand easier as most of the pods will not be up in the higher branches. The pods on a tree do not ripen together; harvesting needs to be done periodically through the year. Harvesting occurs between three and four times weekly during the harvest season. The ripe and near-ripe pods, as judged by their colour, are harvested from the trunk and branches of the cocoa tree with a curved knife on a long pole. Care must be used when cutting the stem of the pod to avoid damaging the junction of the stem with the tree, as this is where future flowers and pods will emerge. One person can harvest an estimated 650 pods per day. The harvested pods are opened, typically with a machete, to expose the beans. The pulp and cocoa seeds are removed and the rind is discarded. The pulp and seeds are then piled in heaps, placed in bins, or laid out on grates for several days. During this time, the seeds and pulp undergo "sweating", where the thick pulp liquefies as it ferments. The fermented pulp trickles away, leaving cocoa seeds behind to be collected. Sweating is important for the quality of the beans, which originally have a strong, bitter taste. If sweating is interrupted, the resulting cocoa may be ruined; if underdone, the cocoa seed maintains a flavor similar to raw potatoes and becomes susceptible to mildew. Some cocoa-producing countries distill alcoholic spirits using the liquefied pulp. A typical pod contains 30 to 40 beans and about 400 dried beans are required to make one pound (454 grams) of chocolate. Cocoa pods weigh an average of 400 g (14 oz) and each one yields 35 to 40 g (1.2 to 1.4 oz) dried beans; this yield is 9–10% of the total weight in the pod. One person can separate the beans from about 2000 pods per day. The wet beans are then transported to a facility so they can be fermented and dried. The farmer removes the beans from the pods, packs them into boxes or heaps them into piles, then covers them with mats or banana leaves for three to seven days. Finally, the beans are trodden and shuffled about (often using bare human feet) and sometimes, during this process, red clay mixed with water is sprinkled over the beans to obtain a finer color, polish, and protection against molds during shipment to factories in the United States, the Netherlands, the United Kingdom, and other countries. Drying in the sun is preferable to drying by artificial means, as no extraneous flavors such as smoke or oil are introduced which might otherwise taint the flavor. The beans should be dry for shipment (usually by sea). Traditionally exported in jute bags, over the last decade, beans are increasingly shipped in "mega-bulk" parcels of several thousand tonnes at a time on ships, or in smaller lots around 25 tonnes in 20-ft containers. Shipping in bulk significantly reduces handling costs; shipment in bags, however, either in a ship's hold or in containers, is still common. Throughout Mesoamerica where they are native, cocoa beans are used for a variety of foods. The harvested and fermented beans may be ground to-order at tiendas de chocolate, or chocolate mills. At these mills, the cocoa can be mixed with a variety of ingredients such as cinnamon, chili peppers, almonds, vanilla, and other spices to create drinking chocolate. The ground cocoa is also an important ingredient in tejate. The first allegations that child slavery is used in cocoa production appeared in 1998. In late 2000, a BBC documentary reported the use of enslaved children in the production of cocoa in West Africa. Other media followed by reporting widespread child slavery and child trafficking in the production of cocoa. Child labour was growing in some West African countries in 2008-09 when it was estimated that 819,921 children worked on cocoa farms in Ivory Coast alone; by the year 2013-14, the number went up to 1,303,009. During the same period in Ghana, the estimated number of children working on cocoa farms was 957,398 children. The cocoa industry was accused of profiting from child slavery and trafficking. The Harkin–Engel Protocol is an effort to end these practices. It was signed and witnessed by the heads of eight major chocolate companies, US Senators Tom Harkin and Herb Kohl, US Representative Eliot Engel, the ambassador of the Ivory Coast, the director of the International Programme on the Elimination of Child Labor, and others. It has, however, been criticized by some groups including the International Labor Rights Forum as an industry initiative which falls short. As of 2017, approximately 2.1 million children in Ghana and Côte d'Ivoire were involved in harvesting cocoa, carrying heavy loads, clearing forests, and being exposed to pesticides. According to Sona Ebai, the former secretary general of the Alliance of Cocoa Producing Countries: "I think child labor cannot be just the responsibility of industry to solve. I think it's the proverbial all-hands-on-deck: government, civil society, the private sector. And there, you really need leadership." Reported in 2018, a 3-year pilot program, conducted by Nestlé with 26,000 farmers mostly located in Côte d'Ivoire, observed a 51% decrease in the number of children doing hazardous jobs in cocoa farming. The US Department of Labor formed the Child Labor Cocoa Coordinating Group as a public-private partnership with the governments of Ghana and Côte d'Ivoire to address child labor practices in the cocoa industry. In 2017, world production of cocoa beans was 5.2 million tonnes, led by Ivory Coast with 38% of the total. Other major producers were Ghana (17%) and Indonesia (13%). Cocoa beans from Ghana are traditionally shipped and stored in burlap sacks, in which the beans are susceptible to pest attacks. Fumigation with methyl bromide was to be phased out globally by 2015. Additional cocoa protection techniques for shipping and storage include the application of pyrenoids as well as hermetic storage in sealed bags or containers with lowered oxygen concentrations. Safe long-term storage facilitates the trading of cocoa products at commodity exchanges. Cocoa beans, cocoa butter and cocoa powder are traded on two world exchanges: ICE Futures U.S. and NYSE Liffe Futures and Options. The London market is based on West African cocoa and New York on cocoa predominantly from Southeast Asia. Cocoa is the world's smallest soft commodity market. The future price of cocoa butter and cocoa powder is determined by multiplying the bean price by a ratio. The combined butter and powder ratio has tended to be around 3.5. If the combined ratio falls below 3.2 or so, production ceases to be economically viable and some factories cease extraction of butter and powder and trade exclusively in cocoa liquor. Fair trade cocoa producer groups are established in Belize, Bolivia, Cameroon, the Congo, Costa Rica, the Dominican Republic, Ecuador, Ghana, Haiti, India, Ivory Coast, Nicaragua, Panama, Paraguay, Peru, Sierra Leone, and São Tomé and Príncipe. In 2016 it was reported that the chocolate producer Ferrero will further invest in Fair trade in cocoa; the plan is to double the amount of cocoa originating from fair trade in the upcoming 3 years. Ferrero wants to invest in 40.000 MT of fair trade cocoa until 2020. As of 2014[update], less than 1% of the chocolate market was fair trade.Cadbury, one of the world's largest chocolate companies, has begun certifying its Dairy Milk bars as fair trade; according to Cadbury, as of 2010[update], one quarter of global sales of chocolate bars will be fair trade. In 2007, the United States imported approximately 1.95 million pounds of fairly traded cocoa. In order to purpose a sustainable and responsible coffee-production, established 1997 the Dutch coffee roaster Ahold Coffee Company in cooperation with coffeefarmers, the UTZ Certified-programme. To achieve this, they created the utz-certificate, which includes the counteracting against child labor and the exploitation of the workers. To receive this certificate, the included farm/company needs to follow a code of conduct in relation to social and environmental friendly factors. Furthermore, the UTZ-program focuses on an improvement of farming methods to increase the profits and salaries of farmers and distributors on site. Children younger than 15 are not employed in any form. Children younger than 18 do not conduct heavy or hazardous work, or any that could jeopardize their physical, mental or moral well-being. On small scale/family run farms, children are allowed to help their families, but only if: the work does not interfere with schooling; it's not physically demanding or hazardous; an adult relative always accompanies the child. No forced, bonded or trafficked labor is allowed in any shape or form. In 2012 FLO-Cert launched the Cocoa Life Program to improve the cocoa supply chain by investing $400 million in the next ten years. Approximately $100 million of the money will be spent for the cocoa supply chain in Ivory Coast, $100 million will be spent to Ghana and the remaining $200 million will be shared between Brazil, Dominican Republic and India. The company is not only investigating in the purchase of certificated cocoa, but focus more on the direct investment in the cocoa supply chain. The Cocoa Life Program advocates for higher incomes for farmers, authorization, inspiring young people and conserving the environment. People around the world enjoy cocoa in many different forms, consuming more than 3 million tons of cocoa beans yearly. Once the cocoa beans have been harvested, fermented, dried and transported they are processed in several components. Processor grindings serve as the main metric for market analysis. Processing is the last phase in which consumption of the cocoa bean can be equitably compared to supply. After this step all the different components are sold across industries to many manufacturers of different types of products. Global market share for processing has remained stable, even as grindings increase to meet demand. One of the largest processing country by volume is the Netherlands, handling around 13% of global grindings. Europe and Russia as a whole handle about 38% of the processing market. Average year after year demand growth has been just over 3% since 2008. While Europe and North America are relatively stable markets, increasing household income in developing countries is the main reason of the stable demand growth. As demand is awaited to keep growing, supply growth may slow down due to changing weather conditions in the largest cocoa production areas. To make 1 kg (2.2 lb) of chocolate, about 300 to 600 beans are processed, depending on the desired cocoa content. In a factory, the beans are roasted. Next, they are cracked and then deshelled by a "winnower". The resulting pieces of beans are called nibs. They are sometimes sold in small packages at specialty stores and markets to be used in cooking, snacking, and chocolate dishes. Since nibs are directly from the cocoa tree, they contain high amounts of theobromine. 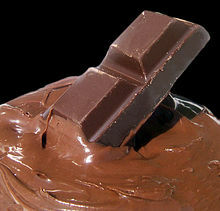 Most nibs are ground, using various methods, into a thick, creamy paste, known as chocolate liquor or cocoa paste. This "liquor" is then further processed into chocolate by mixing in (more) cocoa butter and sugar (and sometimes vanilla and lecithin as an emulsifier), and then refined, conched and tempered. Alternatively, it can be separated into cocoa powder and cocoa butter using a hydraulic press or the Broma process. This process produces around 50% cocoa butter and 50% cocoa powder. Standard[clarification needed] cocoa powder has a fat content around 10–12%. [dubious – discuss] Cocoa butter is used in chocolate bar manufacture, other confectionery, soaps, and cosmetics. Another process that helps develop the flavor is roasting, which can be done on the whole bean before shelling or on the nib after shelling. The time and temperature of the roast affect the result: A "low roast" produces a more acid, aromatic flavor, while a high roast gives a more intense, bitter flavor lacking complex flavor notes. Cocoa contains various phytochemicals, such as flavanols (including epicatechin), procyanidins, and other flavanoids, which are under preliminary research for their possible cardiovascular effects. The highest levels of cocoa flavanols are found in raw cocoa and to a lesser extent, dark chocolate, since flavonoids degrade during cooking used to make chocolate. Cocoa also contains the stimulant compounds theobromine and caffeine. The beans contain between 0.1% and 0.7% caffeine, whereas dry coffee beans are about 1.2% caffeine. The relative poverty of many cocoa farmers means that environmental consequences such as deforestation are given little significance. For decades, cocoa farmers have encroached on virgin forest, mostly after the felling of trees by logging companies. This trend has decreased as many governments and communities are beginning to protect their remaining forested zones. In general, the use of chemical fertilizers and pesticides by cocoa farmers is limited. When cocoa bean prices are high, farmers may invest in their crops, leading to higher yields which, in turn tends to result in lower market prices and a renewed period of lower investment. Cocoa production is likely to be affected in various ways by the expected effects of global warming. Specific concerns have been raised concerning its future as a cash crop in West Africa, the current centre of global cocoa production. If temperatures continue to rise, West Africa could simply become unfit to grow the beans. Cacao beans also have a potential to be used as a bedding material in farms for cows. Using cacao bean husks in bedding material for cows had beneficial effects on udder health (results in less bacterial growth) and ammonia levels (less ammonia levels on bedding). Cocoa beans may be cultivated under shaded conditions, e.g. agroforestry. Agroforestry can reduce the pressure on existing protected forests for resources, such as firewood, and conserve biodiversity. Agroforests act as buffers to formally protected forests and biodiversity island refuges in an open, human-dominated landscape. Research of their shade-grown coffee counterparts has shown that greater canopy cover in plots is significantly associated to greater mammal species richness and abundance. The amount of diversity in tree species is fairly comparable between shade-grown cocoa plots and primary forests. Farmers can grow a variety of fruit-bearing shade trees to supplement their income to help cope with the volatile cocoa prices. Although cocoa has been adapted to grow under a dense rainforest canopy, agroforestry does not significantly further enhance cocoa productivity. ^ "Cacao". Free Dictionary. Retrieved 17 February 2015. ^ "cocoa (n.)". Online Etymology Dictionary. ^ Bingham, Ann; Roberts, Jeremy (2010). South and Meso-American Mythology A to Z. Infobase Publishing. p. 19. ISBN 978-1-4381-2958-7. ^ Kaufman, Terrence; Justeson, John (2006). "History of the Word for 'Cacao' and Related Terms in Ancient Meso-America". In Cameron L. McNeil (ed.). Chocolate in Mesoamerica: A Cultural History of Cacao. University Press of Florida. p. 121. ISBN 978-0-8130-3382-2. ^ "Chocolate Facts". 11 June 2005. Archived from the original on 24 October 2007. Retrieved 12 November 2007. ^ "Cacao Vs. Cocoa: Updating Your Chocolate Vocabulary". Archived from the original on 18 January 2012. Retrieved 12 November 2007. ^ a b "Sweet discovery pushes back the origins of chocolate: Researchers find cacao originated 1,500 years earlier than previously thought". ScienceDaily. Retrieved 13 November 2018. ^ "The Earliest Chocolate Drink of the New World". Penn Museum. 13 November 2007. Archived from the original on 24 January 2013. ^ Wood, G. A. R.; Lass, R. A. (2001). Cocoa (4th ed.). Oxford: Blackwell Science. p. 2. ISBN 978-0632063987. ^ "Chocolate History Time Line". Retrieved 8 November 2007. ^ "The Philippine 2020 Cacao Challenge". Cacao Industry Development Association of Mindanao, Inc. (CIDAMi). ^ Spadaccini, Jim. "The Sweet Lure of Chocolate". The Exploratorium. ^ a b "Theobroma cacao, the food of the gods". Barry Callebaut. ^ Fabricant, Florence (11 January 2011). "Rare Cacao Beans Discovered in Peru". The New York Times. Retrieved 1 February 2014. ^ a b c d e f Wood, G. A. R.; Lass, R. A. (2001). Cocoa. Tropical agriculture serie (4th ed.). John Wiley and Sons. ISBN 978-0-632-06398-7. ^ a b c d e f Abenyega, Olivia & Gockowski, James (2003). Labor practices in the cocoa sector of Ghana with a special focus on the role of children. International Institute of Tropical Agriculture. pp. 10–11. ISBN 978-978-131-218-2. ^ Hui, Yiu H. (2006). Handbook of food science, technology, and engineering. 4. CRC Press. ISBN 978-0-8493-9849-0. ^ Dand, Robin (1999). The international cocoa trade (2nd ed.). Woodhead Publishing. ISBN 978-1-85573-434-0. ^ a b c Gockowski, J. & Oduwole, S. (2003). Labor practices in the cocoa sector of southwest Nigeria with a focus on the role of children. International Institute of Tropical Agriculture. pp. 11–15. ISBN 978-978-131-215-1. ^ "Yeasts key for cacao bean fermentation and chocolate quality". Confectionery News. Retrieved 2 February 2014. ^ "FAQ : Products that can be made from cocoa". International Cocoa Organization. Retrieved 31 January 2014. ^ "Cocoa Life – A story on Farming – Cocoa Growing". Cocoa Life. Retrieved 7 March 2018. ^ Whitmore, Alex (10 April 2009). "Mexican Chocolate: Rustic, Stronger, Better". The Atlantic. ^ a b Raghavan, Sudarsan; Chatterjee, Sumana (24 June 2001). "Slaves feed world's taste for chocolate: Captives common in cocoa farms of Africa". Milwaukee Journal Sentinel. Archived from the original on 17 September 2006. Retrieved 25 April 2012. ^ "Combating Child Labour in Cocoa Growing" (PDF). International Labour Organization. 2005. Retrieved 26 April 2012. ^ Wolfe, David & Shazzie (2005). Naked Chocolate: The Astonishing Truth about the World's Greatest Food. North Atlantic Books. p. 98. ISBN 978-1-55643-731-1. Retrieved 15 December 2011. ^ Hawksley, Humphrey (12 April 2001). "Mali's children in chocolate slavery". BBC News. Retrieved 2 January 2010. ^ "Final Report 2013/14 Survey Research on Child Labor in West African Cocoa Growing Areas Tulane University Louisiana" (PDF). 30 July 2015. ^ Payson Center for International Development and Technology Transfer (30 September 2010). "Fourth Annual Report: Oversight of Public and Private Initiatives to Eliminate the Worst Forms of Child Labor in the Cocoa Sector of Côte d'Ivoire and Ghana" (PDF). Tulane University. p. 26. Archived from the original (PDF) on 19 March 2012. Retrieved 23 April 2012. ^ a b "Protocol for the growing and processing of cocoa beans and their derivative products in a manner that complies with ILO Convention 182 concerning the prohibition and immediate action for the elimination of the worst forms of child labor" (PDF). International Cocoa Initiative. 2001. Archived from the original (PDF) on 24 July 2008. Retrieved 25 April 2012. ^ Monsy, Karen Ann (24 February 2012). "The bitter truth". Khaleej Times. Archived from the original on 15 April 2012. Retrieved 28 April 2012. ^ Payson Center for International Development and Technology Transfer (31 March 2011). "Oversight of Public and Private Initiatives to Eliminate the Worst Forms of Child Labor in the Cocoa Sector of Côte d'Ivoire and Ghana" (PDF). Tulane University. pp. 7–12. Archived from the original (PDF) on 12 April 2012. Retrieved 26 April 2012. ^ Kieran Guilbert (12 June 2017). "Falling cocoa prices threaten child labor spike in Ghana, Ivory Coast". Reuters. Retrieved 7 January 2019. ^ O'Keefe, Brian (1 March 2016). "Inside Big Chocolate's Child Labor Problem". Fortune.com. Fortune. Retrieved 7 January 2018. For a decade and a half, the big chocolate makers have promised to end child labor in their industry—and have spent tens of millions of dollars in the effort. But as of the latest estimate, 2.1 million West African children still do the dangerous and physically taxing work of harvesting cocoa. What will it take to fix the problem? ^ Oliver Balch (20 June 2018). "Child Labour: the true cost of chocolate production". Raconteur. Retrieved 7 January 2019. ^ "Child Labor in the Production of Cocoa". Bureau of International Labor Affairs, United States Department of Labor, Washington, DC. 2018. Retrieved 7 January 2019. ^ "Cocoa bean production in 2017, Crops/Regions/World list/Production Quantity (pick lists)". UN Food and Agriculture Organization, Corporate Statistical Database (FAOSTAT). 2018. Retrieved 28 March 2019. ^ Kisiedu, E. W.; Ntifo, S. E. A. (1975). "Problems of cocoa storage and shipment in Ghana". In Kumar, R. (ed.). Proceedings of the Fourth Conference of West African Cocoa Entomologists, Legon, Ghana, 1974. Zoology Department of University of Ghana. pp. 104–105. ^ Finkelman, S.; Navarro, S.; Rindner, M.; Dias, R.; Azrieli, A. (2003). "Effect of low pressures on the survival of cocoa pests at 18 °C". Journal of Stored Products Research. 39 (4): 423–431. doi:10.1016/S0022-474X(02)00037-1. ^ "Gourmet Gardens: Congolese Fair Trade and Organic Cocoa". befair.be. ^ "CONACADO: National confederation of cocoa producers". Archived from the original on 8 April 2014. Retrieved 27 March 2014. ^ Nieburg, Oliver (8 June 2016). "Ferrero to double Fairtrade cocoa purchases". Confectionery News. ^ "The News on Chocolate is Bittersweet: No Progress on Child Labor, but Fair Trade Chocolate is on the Rise" (PDF). Global Exchange. 2005. Archived from the original (PDF) on 10 September 2010. Retrieved 1 July 2010. ^ "Fairtrade Cadbury Dairy Milk Goes Global as Canada, Australia, and New Zealand take Fairtrade Further Into Mainstream". Archived 30 July 2010 at the Wayback Machine Cadbury PLC 2010. Retrieved 1 July 2010. ^ "Imports of Fair Trade cocoa into the United States from 2003 to 2012 (in 1,000 pounds)". Statista. ^ a b "Certification for Farmers". UTZ. ^ Nieburg, Oliver (19 November 2012). "Mondelez pumps $400m in sustainable cocoa supply chain". Confectionery News. ^ Nieburg, Oliver (20 June 2016). "Cocoa sector remains 'far from' from sustainable". Confectionery News. ^ "World Cocoa Foundation Market Update 2014" (PDF). ^ Nolan, Emily (2002). Baking For Dummies. For Dummies. p. 27. ISBN 978-0-7645-5420-9. ^ Urbanski, John (27 May 2008). "Cocoa: From Bean to Bar". Food Product Design. Archived from the original on 5 June 2008. ^ Ding, Eric L.; Hutfless, Susan M.; Ding, Xin; Girotra, Saket (2006). "Chocolate and Prevention of Cardiovascular Disease: A Systematic Review" (PDF). Nutrition & Metabolism. 3: 2. doi:10.1186/1743-7075-3-2. PMC 1360667. PMID 16390538. ^ Ferri, C; Desideri, G; Ferri, L; Proietti, I; Di Agostino, S; Martella, L; Mai, F; Di Giosia, P; Grassi, D (2015). "Cocoa, blood pressure, and cardiovascular health". Journal of Agricultural and Food Chemistry. 63 (45): 9901–9. doi:10.1021/acs.jafc.5b01064. PMID 26125676. ^ Davison, K; Howe, P. R (2015). "Potential implications of dose and diet for the effects of cocoa flavanols on cardiometabolic function". Journal of Agricultural and Food Chemistry. 63 (45): 9942–7. doi:10.1021/acs.jafc.5b01492. PMID 26111215. ^ "Cocoa nutrient for 'lethal ills'". BBC News. 11 March 2007. Retrieved 30 April 2010. ^ Kim, J; Kim, J; Shim, J; Lee, C. Y; Lee, K. W; Lee, H. J (2014). "Cocoa phytochemicals: Recent advances in molecular mechanisms on health". Critical Reviews in Food Science and Nutrition. 54 (11): 1458–72. doi:10.1080/10408398.2011.641041. PMID 24580540. ^ "Back to the future: Brazilian federal bill re-discovers sustainable cabruca cocoa bean production". confectionerynews.com. Retrieved 12 February 2018. ^ Stecker, Tiffany; ClimateWire (3 October 2011). "Climate Change Could Melt Chocolate Production". Scientific American. ^ "Climate change: Will chocolate become a costly luxury?". The Week. 30 September 2011. ^ Yajima, Akira; Ohwada, Hisashi; Kobayashi, Suguru; Komatsu, Natsumi; Takehara, Kazuaki; Ito, Maria; Matsuda, Kazuhide; Sato, Kan; Itabashi, Hisao (2017). "Cacao bean husk: an applicable bedding material in dairy free-stall barns". Asian-Australasian Journal of Animal Sciences. 30 (7): 1048–1053. doi:10.5713/ajas.16.0877. ISSN 1011-2367. PMC 5495665. PMID 28002931. ^ Bhagwat, Shonil A.; Willis, Katherine J.; Birks, H. John B.; Whittaker, Robert J. (2008). "Agroforestry: a refuge for tropical biodiversity?". Trends in Ecology & Evolution. 23 (5): 261–267. doi:10.1016/j.tree.2008.01.005. PMID 18359125. ^ Caudill, S. Amanda; DeClerck, Fabrice J.A. ; Husband, Thomas P. (2015). "Connecting sustainable agriculture and wildlife conservation: Does shade coffee provide habitat for mammals?". Agriculture, Ecosystems & Environment. 199: 85–93. doi:10.1016/j.agee.2014.08.023. ^ Vebrova, Hana; Lojka, Bohdan; Husband, Thomas P.; Zans, Maria E. C.; Van Damme, Patrick; Rollo, Alexandr; Kalousova, Marie (2014). "Tree Diversity in Cacao Agroforests in San Alejandro, Peruvian Amazon". Agroforestry Systems. 88 (6): 1101–1115. doi:10.1007/s10457-013-9654-5. ^ Oke, D. O.; Odebiyi, K. A. (2007). "Traditional cocoa-based agroforestry and forest species conservation in Ondo State, Nigeria". Agriculture, Ecosystems & Environment. 122 (3): 305–311. doi:10.1016/j.agee.2007.01.022. ^ Pédelahore, Philippe (2014). "Farmers Accumulation Strategies and Agroforestry Systems Intensification: The Example of Cocoa in the Central Region of Cameroon over the 1910–2010 Period". Agroforestry Systems. 88 (6): 1157–1166. doi:10.1007/s10457-014-9675-8.